“A Taste of Nevada” Stateline to Fallon – 91 miles – 2330′ climbing After Breakfast and checking out of rooms, Our first day on the road begins with photographs and opening group photo as riders depart Stateline on Highway 50 – America’s Loneliest Road. The route this day includes riding the southeast shore of Lake Tahoe to the top of Spooner Summit at 7,149′. You’ll enjoy a 2400′ descent down to Nevada’s Historic Capitol, Carson City. Beyond Carson City, you’ll pass the highway leading to Virginia City, site of the famous silver mines of the Comstock Lode. Further east, we’ll travel through Dayton, one of Nevada’s oldest towns established in 1849. Our overnight destination is Fallon, famous for its “Top Gun” Naval Air Station and its award-winning Heart O’ Gold cantaloupes grown on some of the most fertile agricultural land in Nevada. A great dinner and overnight accommodations will culminate this first memorable day. For information on Fallon, contact the Fallon Convention & Tourism Authority at 1-800-874-0903, or visit www.fallontourism.com. “The Longest Day” Fallon to Austin – 113 miles – 4700′ climbing (maybe 5700′) This is a big day! There are five climbs this day and like yesterday, some incredible scenery. We’ll stop at Sand Mountain, a 600-foot tall sand dune (remnants from the sands of a prehistoric sea), and Old Middlegate Station a historic Stagecoach and Pony Express Station. Our traditional Highway 50 route stops at Cold Springs Station for lunch (May offer Old Hwy 50 – Hwy 722 Option), and three climbs are your challenge after lunch: New Pass Summit at 6,348′; Mount Airy at 6,679′; then the climb up to Austin at 6,527′; we will be riding the “traditional” route this year to Cold Springs Station to celebrate its re-opening after it burned down in 2007. We plan to offer the optional Old Highway 50 route (Hwy 722) that may offer more climbing, based on how many participants would like to ride it this year. In 1862, a Pony Express rider kicked over a rock and uncovered a rich silver vein. Within two years, nearly 10,000 people flocked to Austin, which produced over $50 million in silver. Some of the oldest buildings in the state are still standing, like the Stokes Castle, the International Hotel and the Gridley Store. A great meal and overnight accommodations will cap this day’s ride. For more information on Austin, contact the Greater Austin Chamber of Commerce at 775-964-2200, or visit www.austinnevada.com. “A Re(dis)covery Day – I Think! ?” Austin to Eureka – 70 miles – 2600′ climbing Ride Day Three starts with a quick warm-up … the remaining climb up Austin Summit cresting at 7,484′, over Bob Scott Summit at 7,195′ down and across the Big Smoky Valley and back up Hickison Summit at 6,546’. The remainder of the days’ ride is mostly flat with rolling rises and descents, crossing wide-open valleys with vistas that go for 20 miles. We’ll arrive in Eureka for a great afternoon of exploring the many historic buildings, swimming in the Eureka pool and relaxing at the Best Western Eureka Inn, complete with hot tub. In 1878, more than 9000 people resided in this mining community where lead was the principal product, making it the state’s second largest city. Displays in the Eureka Sentinel Museum will give you a feel for the frontier life, and a visit to one of the six cemeteries is also an interesting side trip. Raines Market, the Owl Club, the Eureka Opera House & Court House are some of the sites to visit. A home cooked meal is on tap for the evening complete with Cheers to get you pumped up and comfortable overnight accommodations. For more information on Eureka, contact the Eureka Chamber of Commerce at 775-237-5484, or visit www.co.eureka.nv.us. “Rolling Beauty – Is this Nevada?” Eureka to Ely – 79 miles – 3,900′ climbing America’s Loneliest Bike Tour continues with another challenging day with four summits to cross. The first climb is up Pinto Summit at 7,350′; the second is up Pancake Summit at 6,492′; then Little Antelope Summit at 7,438′ before lunch. We’ll finish the day by climbing and descending the 7,539′ Robinson Summit into Ely. Riders enjoy this day as the topography and scenery offers a different view of the Loneliest Road. Ely is the eastern gateway to “Loneliest Road in America” and is an outdoorsman’s paradise offering hunting and fishing. It is one of the country’s major copper & gold mining regions. You’ll also find the Nevada Northern Railway Museum and the White Pine Public Museum that help tell the story of the region. We’ll enjoy another western hospitality “Thanksgiving” style dinner and a night in a Cell in the “Jailhouse” Motel… but the lure of some of the night spots and casinos may get the better of you. For more information on Ely, contact the White Pine Chamber of Commerce at 775-789-8877, or visit www.elynevada.org. “The ‘AWE’ in Awesome” Ely to the Utah Border, Baker & Great Basin National Park 71 miles – 3,300′ climbing Our final day of riding promises to be one of the most memorable of the tour. We’ll depart Ely and climb over Conner Pass at 7,733′ and continue over Sacramento Pass at 7,136′. We’ll try to all gather at The Nevada/Utah border for a group picture at the Border Inn — the end of the ride. This is where the “Awe” gets put in the word “Awesome” … You’ll see the glacier fields of snow-capped Wheeler Peak at 13,061′ and for the first 20, an optional tour of the spectacular limestone caverns of the Lehman Caves is offered. 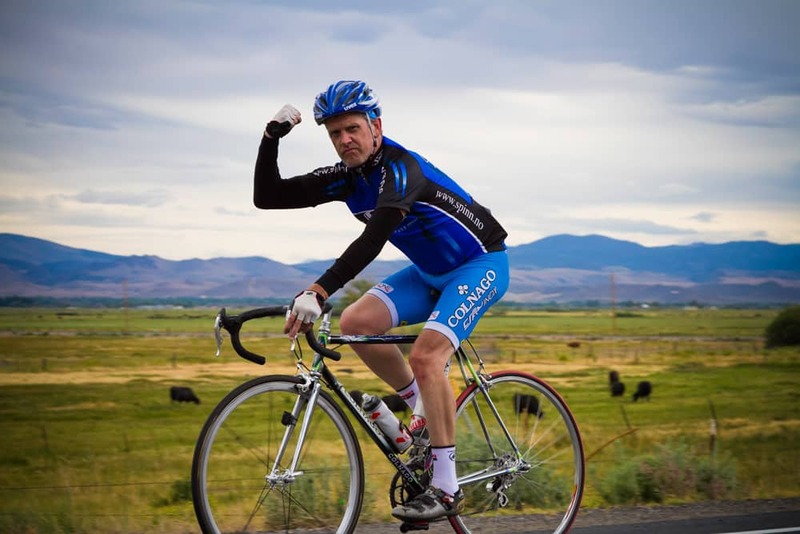 You’ve completed “One Awesome Tour Bike Ride Across Nevada – America’s Loneliest Bike Tour.” The fun begins with a great dinner and special awards will be given out to distinguished participants and everyone receives an “I Survived America’s Loneliest Bike Tour” T-Shirt. All participants will be transported back to Ely to party. “Déjà vu – The Trip Back in Time” The Return to Lake Tahoe Breakfast is served early and all your gear & bikes will be loaded for the return trip to Lake Tahoe. Deja Vu! Everything you rode over the past days will pass before your eyes in reverse. We’ll make final stops in all our host communities, a no host lunch stop in Austin and last chance to pick up some Heart O’ Gold’s in Fallon. Most of all, a time to say goodbye to friends who have shared this experience of riding One Awesome Tour – Bike Ride Across Nevada. Approximate arrival time is 5:00 p.m. Overnight accommodations will be available at the Montbleu Resort (not included). Call 800-648-3322. You and your bike should be in good shape before you attempt this ride. We average 85 or so miles per day. This tour should not be your training ride, but a culmination of your training effort throughout the year. Be sure to have your bicycle checked by your local bike shop prior to your departure. If needed, OATBRAN participants may ride a SAG wagon forward to the next rest stop or night's destination. Our SAG (and bike transport) capabilities are generally limited to standard single rider bikes, which can be mounted on a standard roof rack; any participant who wants to ride a bike that is not compatible with this limitation (i.e., tandem, recumbent, etc.) must obtain our concurrence prior to the event (E-mail tgft@bikethewest.com). It is imperative for your safety, and the safety of all cyclists participating in OATBRAN, that the bicycle Rules of the Road are followed. Please review your "SPIN - Safe Pedaling In Nevada" pamphlet in your welcome packet to familiarize yourself with Nevada's Rules of the Road. TGFT Productions/Bike the West reserves the right to expel participants unwilling to ride in a safe manner. Nevada State Highway Patrol monitors the ride and puts in many hours to assure a safe and enjoyable experience for all riders. Remember, they will issue tickets to those who violate the Rules of the Road. This applies to both bicyclists and motorists. Rest stops and lunch will be set up daily on the course, approximately 20 miles apart. It is important to drink water at regular intervals, before you feel thirsty, to prevent dehydration. Lunch will feature fresh fruits, pasta and potato salads and make-your-own sandwiches. A variety of breakfasts and dinners are prepared and served by local area service clubs and nonprofit organizations from each of the host communities. From pancake feeds to outdoor barbecues, you'll sample the true flavor of Nevada. Please indicate some of your food preferences and/or any special dietary needs, gluten free, non-dairy, or allergies; whenever reasonable we like to accommodate the needs of all riders but riders with special needs should be prepared to bring any special foods which they may require. Please call us to discuss any special dietary concerns you may have. You are limited to 60 lbs. total luggage, and no bag over 35 lbs. All of your luggage must be marked and kept together for loading, unloading and transporting. All luggage will be self loaded and unloaded at the overnight locations. We suggest that you do not bring valuables and it is your responsibility to assure that anything breakable is adequately padded and protected. DO NOT tie pieces together or use plastic garbage bags or ice chests as luggage. It may be helpful to put your clothing inside a plastic bag in case of rain. There is a nearby laundry facility in Eureka. Please pack light! Thank you in advance from our crew! A Late Fee of $150 may apply for late registration and/or late payment. A 10% Discount will apply for Returning OATBRAN riders. Includes: 6 Nights -- with overnight accommodations, based on double occupancy. Security Vehicle parking for the week at Lake Tahoe (at the MontBleu Casino Resort Valet Parking). Ride limited to 50 riders. Sometimes we have to make minor changes to the ride to deal with changes in circumstances, so our attorney says we have to give you the standard caveat: Ride details subject to change without notice. Please check this webpage periodically to get any changes or updates to the ride details. Also, we’ve normally given a 10% discount to Returning OATBRAN riders not just because we like seeing them again, but also because of the help they give to the crew and the new riders; Also, if you are interested in being part of our crew to work and ride at a 50% discount (limited availability), please email tgft@bikethewest.com. Hotel lodging is available at the MontBleu Casino Resort prior to the start and at end of the tour. Make arrangements directly by calling 800-648-3353. Identify yourself for a pre or post OATBRAN room package reservation. Reno-Tahoe International Airport is your gateway airport served by most major carriers. Ground Transportation is available on the South Tahoe Express or by rental car at the airport. Bicycles can be shipped via UPS to Tahoe Sports Ltd., located one block from our host hotel. The shipping address is: 4000 Lake Tahoe Blvd., Ste. 7, South Lake Tahoe, CA 96150. Call 530-542-4000 for details. Their staff will receive it, unpack it, rebuild it and do the same for shipping back to your home for a nominal fee. Tahoe Sports Ltd. may also have rental bicycles available -- call them if you are interested in renting a bicycle for OATBRAN. As for weather, generally it is perfect. Overnight lows are generally in the upper 30's and daytime highs are generally in the 70's. Skies are mostly clear to partly cloudy, and winds are generally prevailing tailwind. However, we've experienced headwinds, rain, overnight snow, morning temperatures well below freezing, and highs into the 90's, so be prepared for any type of weather. For participants with schedule problems, we may be able to provide the option to ride only some days of the ride (at a reduced rate to be determined depending on the particulars). Anyone riding only part of the ride is responsible for their own transportation to their start point and/or from their finish point; we only provide regular return transportation from the normal end of the ride at the Utah border back to Lake Tahoe (or to your start point on the route). Please note that there are neither buses nor any other form of public transportation along (or near) the ride route.